Robert Doyle has been lord mayor of Melbourne since December 2008 – but James Money knows him from an earlier life: Doyle taught him English in Year 8. ‘I felt that the fact he knew who I was would be an advantage in asking him to sit for an Archibald Portrait, and he’d said he liked a political book (Broken promises) I illustrated four years ago,’ says Money. Money went to Melbourne Town Hall where he did a series of sketches and took photographs. He initially considered painting Doyle sitting in a large, ornate, dark wooden council chamber chair but decided to simplify the portrait. Then he tried using a brown background to suggest the traditional nature of Mayoral role. Money uses an old-fashioned scraperboard technique. He made the board for this portrait from Masonite, which he covered with 12 layers of clay mixed with white acrylic. Once dry, he put a layer of black Indian ink over the top then made the portrait by scratching into the surface almost like an original etching. From there he used watered-down inks and aerosol cans and, again, scratched the colour back. Born in Melbourne in 1974, Money graduated from the Victorian College of the Arts in 1995. 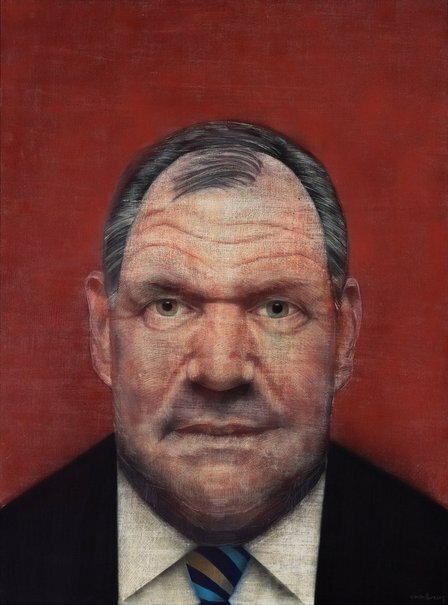 In 2003, he won the Savage Club Drawing Prize. This is his first time in the Archibald Prize.